Aspen Global Leadership Network (AGLN) fellows and nominated participants from around the world come to the Action Forum to get inspired. Registration form built using Form Assembly updates each attendee’s profile, session registration and payment in Salesforce. A Conga Composer template generates personalized agendas. Staff spends less time wrangling data and more time connecting with attendees. 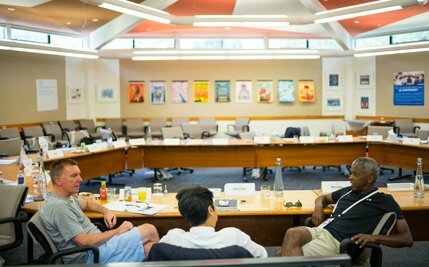 Hundreds of Aspen Global Leadership Network (AGLN) fellows and nominated participants from around the world attend the Resnick Aspen Action Forum each year. The event features more than 200 sessions created by AGLN staff. Attendees choose up to 30 individual sessions in a complicated registration process. Event organizers must update existing attendee’s profile, contact information, family member profiles, ventures/projects, session registration and payment. AGLN staff spends several months documenting their ideas in Salesforce for the 200+ sessions they will offer during the five-day conference. Once the sessions are set, a registration form is built using Form Assembly. The form updates each existing attendee’s profile, session registration and payment in Salesforce. Personalized agendas are merged using a Conga Composer template which display about 30 sessions specific to each attendee on a multi-page badge worn around the neck. Action Pledges, created using a Conga Composer template, are posted on a 40-foot wall in the center of campus as a catalyst for conversation and networking. Staff turns to Salesforce or Salesforce1 mid-event to assist attendees, change session registrations, generate daily schedules, set up name tent cards in the meeting rooms and print new Action Pledges. Attendee feedback is collected through an evaluation survey built with FormAssembly and the results are logged in Salesforce and displayed on a live dashboard of overall event feedback and the highest and lowest rated sessions. As a result of AGLN’s investment in their Salesforce database, the staff spends less time wrangling data and more time connecting with attendees. AGLN is now able to implement the ideas they dream up each year to better serve their fellows and participants. Each success at their conference means a success for their attendees’ ventures, which touch millions of lives globally.